Thermospheric neutral winds play important roles on the dynamics of the upper atmosphere. We use extensive F region zonal and meridional wind data measured by the Wind Imaging Interferometer (WINDII) instrument on board the Upper Atmosphere Research Satellite (UARS) to study the mid-and low-latitude daytime average perturbation winds during magnetically disturbed periods. We have determined the perturbation winds by subtracting the quiet time wind values along the satellite orbits. Our data indicate large changes in the latitudinal profiles of both the zonal and meridional disturbance winds from morning to afternoon hours. The early morning zonal disturbance winds are eastward near the equator and at upper mid-latitudes (above 50°), and westward at lower mid-latitudes. The mid-morning and afternoon zonal disturbance wind patterns show very small amplitudes at low latitudes and increasing westward winds at mid-latitudes. These latitudinal profiles are in excellent agreement with the patterns derived from zonal wind measurements on board the DE-2 satellite. The meridional daytime perturbation winds are equatorward and have magnitudes increasing linearly with latitude, with largest values in the early morning sector. The zonal and meridional disturbance winds show an approximately linear increase with the Kp index during geomagnetically active conditions. 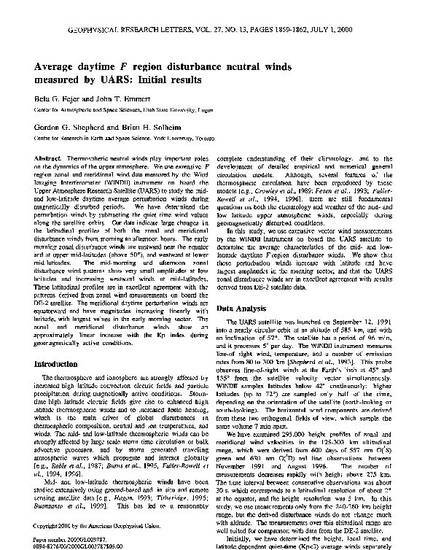 Fejer, B. G., J. T. Emmert, G. G. Shepherd, and B. H. Solheim, Average daytime disturbance neutral winds measured by UARS: Initial results, Geophys. Res. Lett., 27, 1859, 2000.